What is more wonderful than the lush and heady peony? One could just eat it! 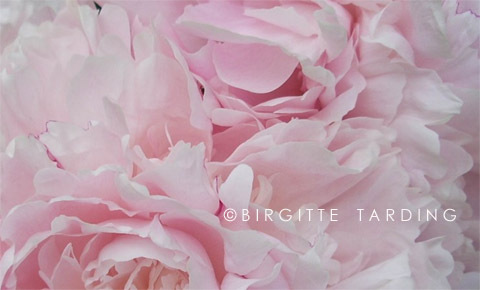 I have a peony plant in my garden, and I am always looking forward to the day that I can see the flowers. They are realy glorious, lush,heady, and georgeous as you write. And this summer, when I pick the flowers, I will think of you, knowing that somewhere far away, you will be enjoying the same flower. Nice to know. The delicacy of these petals is breath-taking. Your cropping invites the imagination to unfold in its lush presence. The peony is known as “the king of flowers.” It is an enduring motif in the fine and applied arts in Japan — first introduced in the Nara period. In Heian times, the Japanese prized the peony as an ornamental plant. sheets on a bed with a view of the beach and the breeze streaming through open windows. Your poetic words should almost follow this photo, one of the most copied images at this blog. I saw it at the new system called “pinterest”, shared again and. Hi Cindy. I am following your exhibition, it is all very exciting. I hope you will sell every piece of your fantastic photos. I wonder how you bumped into this old photo? Thank you anyway. I like it too, peonies is one of my absolutely favorite flowers. Thank you very much, Haraj. Wow! that photo needs to go into a competition!!! LOVE it!!! This photo has been shared many places, which is OK, but it has also been taken and used as if it was the persons own , and I´ll not be surprised if it even is for sale somewhere. It is a major problem on the internet, that copyrights not are being respected. It is so easy to mention the source of a photo, and I am sure a normal person would react negative if a stranger on the street took a photo of them, and then used it lets say for commercial matter, but apparently these to things are not easy to connect. There are layers who are willing to take these cases for free, and then share half/half. That could be a solution. I have started to put my name on every new posts, as a start, and I never post big photos anymore. Too bad it has to be that way. PS. I have written my name on it now, and changed the size.